Planning a ski trip to the French Alps or the French Pyrenees? Discover our winter discounts that will allow you to profit even more of your holiday on the French ski slopes. To profit from these offers, all you have to do is create an account on our website using your European Youth Card number. Once you’re registered, follow the instructions at the bottom of the page of the discount you’d like to profit from. If you don’t have a European Youth Card, order yours now! 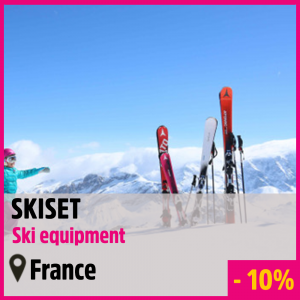 Skiset is the first online ski and snowboard rental site with over 350 stores in 150 resorts in France that allow you to rent the best equipment at the best prices. 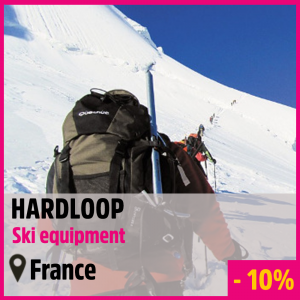 With your European Youth Card, enjoy a 10% discount on your ski gear rental! Find out more here. 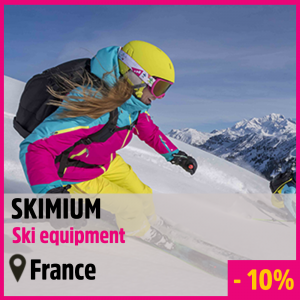 Skimium allows you to book your ski and snowboard gear online from a network of over 350 stores in 250 ski resorts in France, Andorra and Italy. Skimium searches for the best deals and will allow you to save up to 60% on your rental equipment (depending on the season). With your European Youth Card, profit from an additional 10% off ! Find out more. Hardloop is a community and E-commerce platform dedicated to nature sports. Users can find their sporting equipment, more than 50 technical brands and more than 3500 products for sports activities (like hiking, skiing, climbing or trail running!). To inspire the community, Hardloop also has an area with over than 1700 sports adventure ideas with clubs, and connexion with mountain guides or instructors. Enjoy a 10% discount with your European Youth Card. Find out more. Go Sport is a sporting goods retailer with over 425 stores in France. With your European Youth Card, profit from 15% discount. You will also be able to enjoy an extra 10% off on the ski equipment rental on the website www.gosportmontagne.com. Find out more. The Passe Montagne Card allows you to enjoy skiing in over 100 ski resorts in the Alps and the Pyrenees. You can enjoy up to a 40% discount on your ski pass! With your European Youth Card, profit from a 50% discount on your Passe Montagne card and start skiing at discount rates! Find out more. The UCPA is a huge French non profit organisation that offers over 80 different activity courses at 70 destinations across France plus a further 19 centres overseas. Reveal your true nature through sport and experience unique moments. You choose: climbing, trail, hiking, mountaineering, ski / snowboard (tracks, off-tracks, freeride, freestyle), ski touring, snowkiting, speedriding, and more! In addition, it’s all inclusive, everything is on site and on the best spots! Profit from a 5% discount on your UCPA holidays with your European Youth Card. Find out more. If you find any problems, don’t hesitate to write as an email at info@cartejeunes.fr or to send us a text using WhatsApp!